Members of the Nigeria Zero Hunger Forum have taken proactive steps to ensure that malnutrition and hunger will no longer be experienced in the country by 2025. To achieve this goal, the forum agreed during the launch of its “Synthesis Report of the Nigeria Zero Hunger Strategic Review” earlier last month to select five pilot states (Benue, Ogun, Ebonyi, Sokoto, and Borno) where at least one livestock and two major food crops will be commercially produced to help feed the country. The Secretariat that coordinates the activities of the forum is based at IITA in Ibadan with additional offices and farms in Abuja, Kano, and Onne. Kenton Dashiell, IITA DDG, Partnerships for Delivery (left), presents the implementation document of the Forum to His Excellency, Engr. Dave Umahi, the executive Governor of Ebonyi state. Accordingly, on 26-27 January, a visiting team comprising experts from IITA, the World Food Program (WFP), and AfricaRice were in Ebonyi State to initiate plans to complement the State’s projects on rice, cassava, and seed production. The visitors, led by Kenton Dashiell, IITA Deputy Director General, Partnerships for Delivery, were received by His Excellency, Engr. Dave Umahi, and his Deputy, H.E. Barrister Kelechi Igwe. 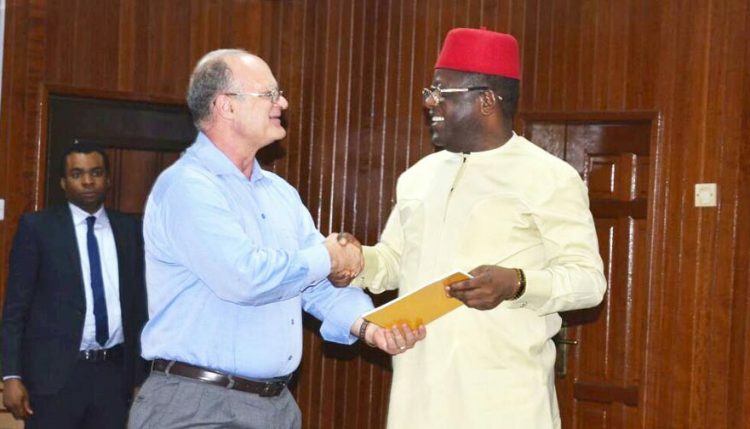 Dashiell commended the state government for accepting to work with the Forum, shared the road map for the operations of the forum, and said that the state would still need support to deliver expected results at scale. Other members on the visiting entourage were Peter Kulakow, IITA Cassava Breeder; Francis Nwilene, Entomologist, Country Representative/Coordinator, AfricaRice; Abraham Shaibu, Rice Seed Expert, AfricaRice; Femi Amure, Advisor/ Liaison, World Food Program, Nigeria; Najimu Adetoro, IITA Cassava Breeder; and Toyin Oke, IITA Manager, Resource Mobilization, Protocol, and External Liaison Office. The scientists made presentations on various crops. Everyone agreed that scaling up of the various agricultural activities in the State should begin immediately and include sourcing investors to drive and support the initiatives on ground. Barr. Igwe, accompanied by the State’s Commissioner for Agriculture, Heads of Ebonyi State Crop Unit, and representatives of IFAD, and FADAMA, led the visiting team on a tour of some of the State’s farms and infrastructures. The Forum will meet for a full day every 6 months to share reports, updates, and challenges. During these biannual meetings, the group will go on a field tour to see accomplishments and challenges first-hand, and thereafter recommend appropriate action points . The first in the series of these meetings will be hosted by Benue State in Makurdi in June 2017. The Forum was constituted during the first quarter of 2016 to help the Federal Government of Nigeria achieve the 2030 Agenda for Sustainable Development agreed upon by Heads of State and Government at the Special Summit of the United Nations held in September 2015. It is chaired by former Nigerian president, His Excellency, Chief Olusegun Obasanjo with members composed of the chairs of the nine subcommittees of the Zero Hunger Strategic Review, as well as Governors of the five pilot States.